I have been an insurance agent for over 12 years now and have been selling health policies for the same period. I started of as a part timer and decided to become an agent when I realized I had a natural knack for selling. Insurance is something that will never go out of vogue and considering the rate of inflation its importance is more pronounced than ever. Even undergoing for a routine health check up or a normal tooth cavity filling in your dental clinic can cost a lot of money. The more serious the illness the deeper it is going to burn a whole through your pocket if you remain uninsured. So a career selling insurance can be a rewarding one if you are up to the task. For the last 4 years I have been successful in opening my own agency and have several people working under me. I started of with health products and have stuck to that ever since. However in my experience even packages like car, home and other insurance plans have significant market potential. An important process of my development into successful agent can be attributed to several factors. As one meets more and more clients on a daily basis, your ability to convince them automatically improves. You become more confident and reassuring of what you sell and your ability to read a customers body language also gets enhanced considerably. Another key aspect for my growth as been to use the best of what technology has to offer to create genuine and promising leads. The Internet has revolutionized the way the business is run and many agents still fail to realize the full potential behind it. Also you also need to figure out when would be the ideal time to start your agency and hire your own set of agents. A lot of agents fail to realize the potential behind starting your own agency and the rewards that can be derived from it. I started as an employee in an agency where I was a salaried employee. The company dealt with all kinds of products related to insurance and I was assigned to selling life insurance. Work until you develop a firm understanding of the industry and build for yourself a robust network of contacts within the industry. 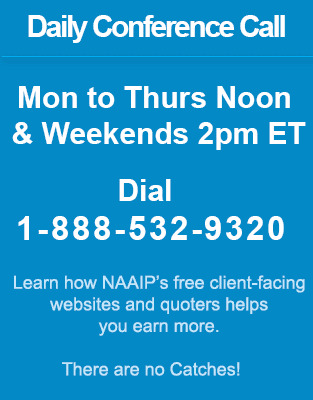 Become a member of NAAIP where you can get in touch with other agents and build your contact base. You can also take up courses to become more well versed with your products. Use forums such as www.naaip.org/agents to generate promising leads in your locality. Once you have developed a firm presence in the industry you can use the opportunity to go freelance. Create aunqiue identity for your company which could possibly evolve in to a brand of its own tomorrow. So do not choose any mundane names and pick one that suits your company’s vision and profile elegantly. It would be a good idea to get into a partnership that has a substantial loss ration but enjoys many carrier appointments. See if the company is ready to eke out a deal for 10 to 15 percent cut by bringing you in. As your revenue increases the cut for that company should reduce which makes it possible for you to split away after a certain figure has been reached. Say $1 million or $2million depending on what you have in mind. I personally split away at $4million by which I had generated enough business on the books. Now hire your own set of agents to sell insurance to people based on the leads generated by you or by themselves individually. There are several forums on the internet where you can co-op the cost of buying leads or pay for them entirely yourself. Small gestures like wishing your clients on festive occasions and birthdays can go a long way towards improving your companies relations with them. Estimate the percentage of sales target you have in mind and work towards that goal. Tell your agents to not hesitate to ask for referrals from clients. If they are happy with your service they would definitely want to recommend. For instance an ideal target in my agency for an employee selling home/auto insurance has an average annual premium of about $1800. So in order to average about $50,000 on a monthly basis in the form of new premium an employee would have to average 5 to 10 clients per week. That comes to about 1 customer a day and with 8 hours of working time, that is a pretty much achievable feat. Hire more agents as your agency grows in stature and revenues and offer them the same kind of cut like you had when you started off. However pick your agents carefully and make sure they are adept at their jobs.